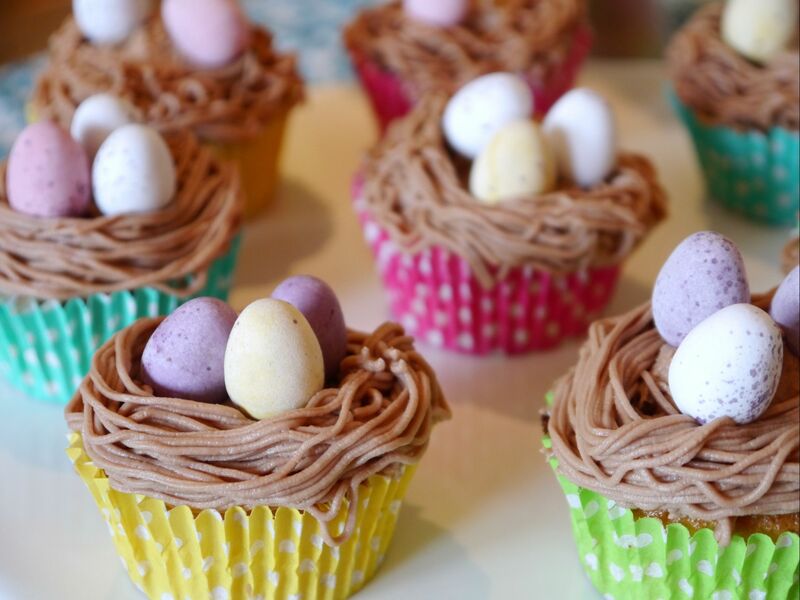 A nice cupcake recipe to make with kids this is a perfect Easter holiday activity. The only specialist equipment needed is a piping nozzle to give a grass effect – I use a Wilton 233 tip, and a piping bag. This recipe is a favourite with my kids because they can do almost all of it themselves – yes the nests can look a little wonky but the pride that they have made something themselves makes it all worth while. Vanilla cupcakes topped with chocolate frosting and mini eggs. Melt the chocolate in a microwavable bowl using 15 second bursts and stiring between each burst until the chocolate has melted. Stir the chocolate into the frosting. Smooth a thin layer of the chocolate frosting over each cake then use the grass effect nozzle to pipe circles around the edge of each cake. Add mini eggs to the centre of each cake. To soften the butter you could simply leave it on the side for an hour, but I always forget so I place it in a microwavable bowl and heat in 10 second bursts, removing and mixing each time. The aim is to soften the butter a little not to melt it. If the butter does melt a little, use a fork to mix it back together with the rest of the butter. These are simply adorable! Thank you for sharing the idea Jenny!